For class again — I’m supposed to come up with a three beat/elevator pitch/tagline for myself. I’m not supposed to explain anything so I guess I’m not going to write anything else here. Ok bye! Your three beat (with your illustrations, of course) makes me think that you work hard, but you enjoy it. The fact that you drew the same face for yourself doing CS homework and drawing comics emphasizes your enjoyment. I hope that you aren’t disappointed that your two passions require the same type of concentration and work ethic–I think it actually makes sense. I really also love how you express yourself through comics, it is such a creative outlet for you and they just keep getting better and better. I really like your comic, because I think I know that feeling as someone who draws. For me it seems like homework and drawing both require really deep focus and concentration, which inspire that particular facial expression. The thing with art though is that you’re really excited about the outcome and the concept so it’s an enjoyable, if sometimes strained, concentration. But I don’t know, maybe you adore the concepts and outcome of your computer science homework and they really are the same. For me rarely am I as excited about my homework as my artwork, but it happens. Hey, interesting comic! The words alone imply that you lead a secret double life as a comic artist, while appearing to be a computer scientist to the public eye. The pictures imply that art and computer science both require the high level of focus and concentration implied in your character’s face. I’m not sure how “enjoyment” can be derived from the facial expressions, as Tiffany commented — that statement assumes that you enjoy comic artwork, and since the panels depict the same emotion, you enjoy studying computer science. The first assumption is relatively safe, but not the second; since I’m a computer engineering major and comic artist, I know that studying for classes is a lot more boring and dull than drawing! I would agree with Tiffany if the left panel’s occupation was “computer programmer” or “computer engineer” rather than “computer science student.” Whenever you have to take a class where your performance is measured and recorded as a number on a permanent record, which you can never erase or make up for, and which people will always judge you by, it’s hard to approach it with the same attitude as something more subjective like art. I wonder why you didn’t put a computer in the left panel — are you taking theory classes right now? If so, I would make the character on the left look very, very tired and bored! Also, you’re not the only comic artist this week! Check out my blog here! Though your two panels are nearly identical, they help to convey the meaning of your tagline. The “A by day, B by night” tagline is a reference to the traditional superhero story line (ex. Bruce Wayne by day, Batman by night). However, with you, there is no dramatic change in appearance, there is no costume change. You approach comics at night just as much concentration and determination as you would study computer science during the day. The only change from day to night is that you are toiling on something different. I think this is an interesting combination of personalities. Computer science is more technical and process driven in many cases. Granted, creativity is essential to be a good computer scientist, but perhaps not the same type of creativity that something like art would require. Drawing comics takes a more free flowing thought process and takes some natural drawing ability. However, from the panels in the comic, it seems that you have almost the same approach to both things, which is pretty cool. I… don’t understand. Why is a computer science student writing sentences on a piece of paper? I know paper is still quite handy for sketching out diagrams and such, and still definitely rocks for doing math, and if there’s no computer around (which was much more likely in 2010 than it is now, what with the prevalence of smart phones and tablets and such), then a piece of paper is a great back-up for jotting down notes and quick thoughts and shopping lists. But writing multiple paragraphs on paper? What kind of lame computer scientist is that? Aside from the obvious choice of Word or Notepad (or TextEdit on a Mac), a hard-core computer scientist would be writing essays and such using nano or LaTeX or emacs or, for full bonus points, vi. So, what’s the deal? Willing suspension of disbelief for the sake of the joke? I guess I can go with that. 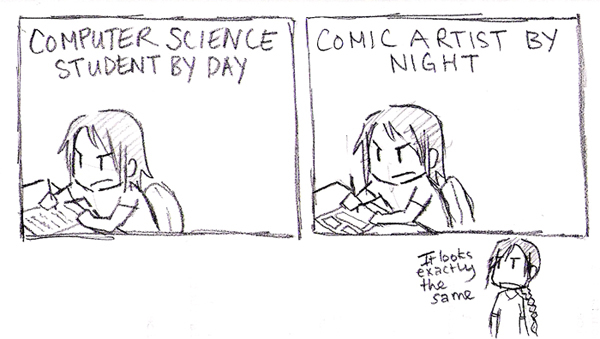 Haha, I guess I should have been drawing boxes in the first panel too! I like drawing out my system designs before jumping into coding. Just a visual thinker, I suppose.